– The GPA information isn’t relevant to most employers. Since your resume is on the longer side to begin with, gain some space by leaving it off. – Is there a reason why you separated out “volunteer” from “experience”? They both seem like experience to me! Don’t undervalue your volunteer time. – Your skills section doesn’t list anything outside of the norm. In this day and age it’s expected that everyone can work with Microsoft Office and others. You risk dating yourself or making yourself look out of the technology loop by listing these things. – The font you’ve chosen for headings looks like a typewriter font — which normally I like but for resumes risks looking dated. You want something more streamlined. Same for font color. First of all, let me just say I think it’s super brave of you to put your cover letter and resume online for others to critique. It definitely shows your motivation to enter the profession and your commitment to being a great candidate. You’re awesome! – Instead of segmenting out “volunteer” from “work” experience, think about lumping together “library experience” instead. You have a lot of it, it’s just scattered throughout the your resume. – I also agree with the previous commenter about not needing to list the skills you list. Use that space to highlight more unique or tech-focused abilities (e.g. HTML/CSS experience, coding languages, foreign languages). – I think you can ditch the GPA info. – Instead of “Organizations” say “Memberships” and consider getting more involved with those organizations that offer virtual committee memberships. Conference attendance can be so expensive, but the more involved you are with a professional organization, the more opportunities are available to you. 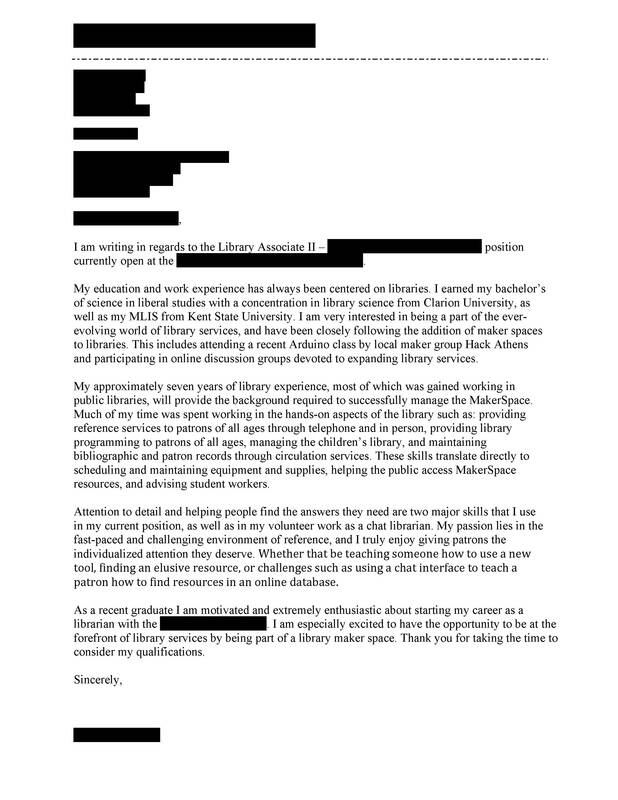 This is tough, because each cover letter you create should be uniquely tailored to the library and position to which you are applying. That said, one thing that stood out to me about your cover letter is that you reiterated a lot of the information listed in your resume. Think of your cover letter as the space where you can go into detail about projects you’ve completed in the jobs listed in your resume (that are relevant to the job description), or highlight a particular accomplishment that you think meshes well with the desired job. As an example: If you’re applying to a children’s librarian job, tell me more about the scavenger hunt you helped create at the St. Mary’s Public Library! Best of luck! I know how challenging it can be to launch a job search while geographically locked in. Take care. You have “Android” misspelled under your skills section. I think that’s a thing you can leave off, but if you leave it on, make sure to fix that! First of all- Good luck on your job hunt. Cover Letter: This is hard to critique without knowing what sorts of work you are interested in. The letter reads to me like a list of skills, rather than business correspondence. It also feels very generic. I want to feel like I am getting to know a candidate from their cover letter. Remember that the purpose of a cover letter is to get someone to give your an interview. Think about what you have done that will make someone go, “huh, I want to know more about that…”, because intriguing your readers is critical. 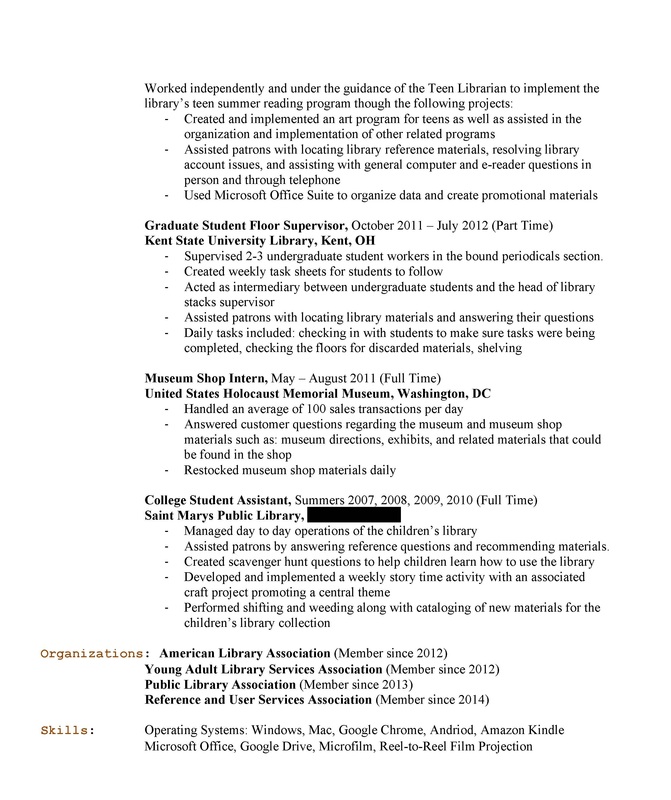 Resume: Most of what I think has already been expressed by others. Your GPA doesn’t matter. The skills you list feel generic- try to use action words like created, managed, instructed rather then “walked through”. Formal language is usually better on a resume. Lastly, cut the color- it just makes you look unprofessional. I would condense the experience points somewhat, especially in some of your older positions; you can likely merge a couple for most of the sections. In general, I try to make sure that the number of points for each position is never less than the number of points for the position below it. I would consider removing the undergraduate GPAs. 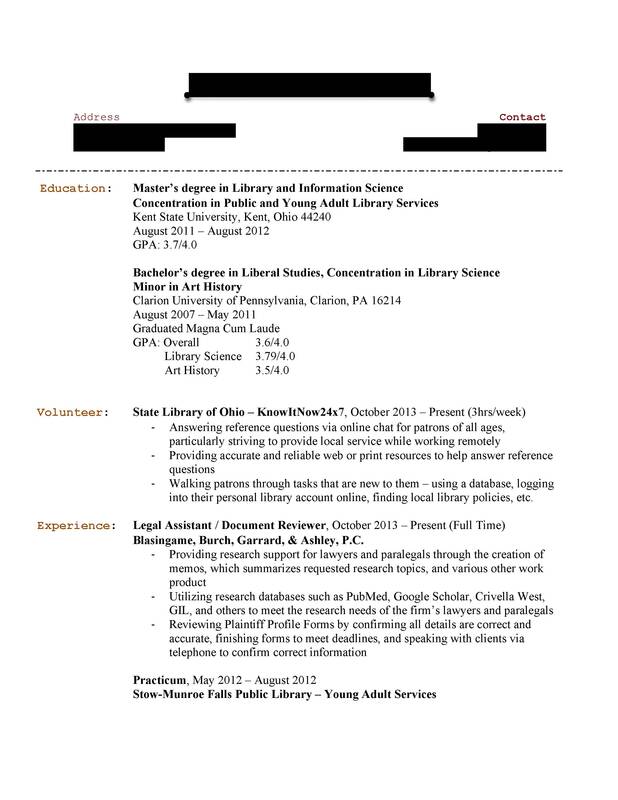 Unless you’re applying for some kind of art librarian or curator position, it’s not really as important as your MLIS GPA. If you are applying for an art librarian position, though, I’d recommend sticking it back in to solidify your credentials. ZIP codes on your schools are unnecessary; city and state should suffice. Combine your “Volunteer” and “Experience” sections. Experience is experience, regardless of whether or not it’s for pay. The heading for your practicum is orphaned, probably because your word processor is being lazy. This may fix itself as you tweak other parts. If not, there should be an option to “Keep with next paragraph”, or you can just fix it manually. Also, the first list item under that heading needs a bullet. There’s an impressive amount of experience here; I have no doubt you’d be a strong contender for any reference position you applied to. I wish you the best of luck in your job search.